Note from the editors of Anglican Ink. This background paper prepared by the Washington think tank the Jamestown Foundation reports on the latest moves by the Community government to control religion in China. It comes as Archbishop Justin Welby prepares to travel to China this month. 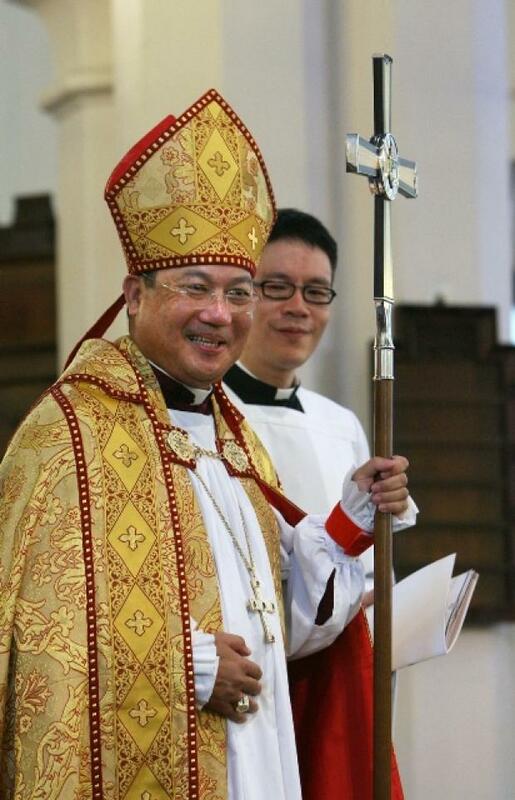 It should be further noted the Archbishop Paul Kwong of Hong Kong is a member of the Chinese People’s Political Consultative Conference described below and an outspoken critic of the pro-democracy movement. He is also chairman of the Anglican Consultative Council. In March, the National People’s Congress and the Chinese People’s Political Consultative Conference both convened their full annual sessions in Beijing. Collectively known as the “Two Sessions” (Lianghui, 两会), the annual meetings of these bodies comprise two of the largest annual events on the official political calendar of the People’s Republic of China (PRC). The two institutions hold no real power, but the scripted agendas of their meetings often provide insights into the concerns and prioritized policy initiatives under discussion within the higher echelons of the Chinese Communist Party (CCP). Of the two institutions, the Chinese People’s Political Consultative Conference (Zhongguo Renmin Zhengzhi Xieshang Huiyi, 中国人民政治协商会议), or CPPCC, is the one less understood by many foreign observers. The CPPCC is a legacy of the founding of the People’s Republic of China (PRC) in 1949, when it was convened as a nominal representative body for the various parties and other political groups organized under the Communist-led coalition in the later stages of the Chinese Civil War (1946-1949). Since then, the CPPCC has continued official existence as a political advisory body for the government—while operating in reality as a propaganda forum stage-managed by the CCP United Front Work Department (Zhongyang Tongzhan Bu, 中央统战部), or UFWD. This year, a primary propaganda theme emerging from the CPPCC was the need to “persist in the Party’s leadership over religion [and] persist in advancing the Sinicization of our country’s religions” (jianchi dang dui zongjiao gongzuo de lingdao, chixu tuijin woguo zongjiao Zhongguohua / 坚持党对宗教工作的领导，持续推进我国宗教中国化). The theme is not a new one, and dates back at least to 2016, when CCP General Secretary Xi Jinping gave a speech advocating a “socialism with Chinese characteristics theory of religion” (Zhongguo tese shehui zhuyi zongjiao lilun, 中国特色社会主义宗教理论) (Xinhua, April 23 2016). The theme has since grown more prominent in official discourse, and in the lead-up to this year’s convening of the “Two Sessions,” official media indicated that “Sinicization” of religion would be an important topic to be discussed by the CPPCC (Renmin Zhengxie Bao, January 10). Shen Bin, deputy head of the Chinese Patriotic Catholic Association, stressed the need “to adhere to the leadership of the Communist Party of China, uphold the direction of Sinicization and strengthen the implementation of Regulation[s] on Religious Affairs” (Global Times, March 10). Most striking of all, the CPPCC was used as a forum to advocate the purging of foreign influences from Chinese religious practice. In a speech delivered before the CPPCC on March 11th, Xu Xiaohong, Chairman of the “Three Self Patriotic Movement” (San Zi Aiguo Yundong, 三自爱国运动)—the PRC’s official Protestant church—stated that the advent of Christianity in China was accompanied by “intense colonial aggression by the West.” Xu accused “anti-China forces in the West” of “trying to influence China’s social stability and even subvert China’s political power through the use of Christianity.” In light of this, Xu called for “continuous elimination of foreign imprints on China’s Christian churches,” and for China’s Christians to “continuously carry forward and practice the core values of socialism” (Taiwan Central News Agency, March 12; Hong Kong Free Press, March 13). However, the coordinated propaganda showcased at the CPPCC is also part and parcel of a broader drive over the course of the past year to reinforce the CCP’s control over all aspects of Chinese life: to include not only religious faith, but also culture (China Brief, March 5) and public discourse (Apple Daily (HK), May 14 2018). Additionally, the propaganda themes featured at the CPPCC must be understood against the backdrop of evident CCP concerns for the direction of the country, and attendant prospects for social unrest (China Brief, March 22;China Brief, March 22). As long as the senior leadership circles of the CCP harbor anxieties about the security of their ruling status, the campaign for “Sinicization” of religion—as well as other aspects of civic life—is likely to continue. There are differences of interpretation regarding the translation of the key Chinese-language term “Zhongguohua” (中国化)—which could be interpreted as “Sinicization” (implying an effort to bring something more closely into line with Han Chinese culture); or as “China-fication” (implying that the thing in question will be nationalized, and/or brought under firmer state control). English-language outlets of official PRC state media generally use the former translation; however, the latter translation arguably better captures the meaning behind the government’s drive to further Zhongguohua the practice of religion in China. For an authoritative commentary on the issue published under the name of the director of the CCP United Front Work Department, see: “You Quan: Persist in the Party’s Leadership over Religion, Persist in Advancing the Sinicization of Religion” [尤权：坚持党对宗教工作的领导，持续推进我国宗教中国化], Xinhua, March 20, 2019.http://www.zytzb.gov.cn/tzyw/306776.jhtml. Congressional-Executive Commission on China, 2018 Annual Report, p. 122.